If you will be carting people around on a regular basis, you may want to increase your limit of liability. The more people in a car during an accident, the higher medical expenses and other damages could be. Carrying a high limit of liability protects you, your passengers, and anyone else injured in an accident. Although many drivers carry about $100,000 in liability coverage, you may want to consider carrying up to $1,000,000. This will increase your monthly insurance premium, but it’s perfectly acceptable to ask your passengers to help pay for this. 1. 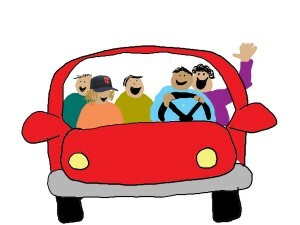 The purpose of the carpool is to transport us between our respective workplaces in downtownBostonand each of our respective homes. 2. Participation in the carpool is voluntary. Any rider may withdraw at any time, but we each agree to try to give as much notice as possible before ending our participation. 3. The carpool will begin on August 7, 20xx and will continue as long as there are riders willing to take part. 4. Any of the riders may volunteer to drive, and we will rotate drivers each week to ensure that driving responsibilities and expenses even out. Riders who do not ever drive will pay the driver $2 per day, or $10 per week, payable every Friday. 5. We will buy a quarterly parking pass for the downtown garage at Franklin and Hawley Streets. The cost is $300 per quarter. We will divide the cost evenly among riders. Since the pass may be hung on the rearview mirror, at the end of each week the driver will give the parking pass to the designated driver for the following week. 6. In the morning, we intend be on the Massachusetts Turnpike heading for Boston by7:45am. We will determine an order for pick-up based on who is driving on that day. We will select specific pick-up times for each rider, and riders will try their best to be on time. The carpool won’t wait more than 5 minutes. 7. The driver will make one stop at the corner of Water and Oliver Streets, a second stop at Federal and Franklin Streets, then park the vehicle. 8. At the end of each day, the driver will retrieve the car from the parking garage at5:40and make the stops in reverse order. It is imperative that everyone is waiting to be picked up by 5:40, to ensure that the driver does not have to circle back to pick up late riders. 6. We will let each other know if and when we are available to be back-up drivers, in the event that a driver is sick or for any other reason not available on a day that driver is designated to drive. 7. We all agree to maintain current insurance coverage on our vehicles as required by law, and each carry a per-accident limit of at least $500,000 in coverage.